Rev. Alphonso N. Scott, the 14th Pastor of Bethesda Missionary Baptist Church is the son of Evelyn G. Scott and the late Benjamin Scott of Georgetown, SC. After graduating from Elementary School (St. Cyprians - St. Mary) he attended and graduated from Winyah High School. He earned a Bachelor of Science Degree from Benedict College (Columbia, SC), majoring in Marketing and Economics. While a student at Benedict College, he served as a member of Gordon - Jenkins Pre-Theological Association, President of the Benedict College Concert Choir and recipient of the Leadership Award. During the presidency of Dr. Henry Ponder, he was selected to serve as "President for a Day" and invited to dine with the late Dr. Benjamin E. Mays. Pastor Scott also earned a Master of Divinity Degree from Morehouse School of Religion, the Interdenominational Theological Center in Atlanta, GA. He is listed in the 1986 edition of Outstanding Young Men of America and Who's Who Among America's Professionals. He is also a lifetime member of Alpha Phi Omega Fraternity, Inc.
Pastor Scott accepted the call to preach at a very early age. He was licensed to preach from his home church, Bethesda on May 21, 1978 (Trial Sermon: "What's So Special about Jesus?") He was later ordained by the Jerusalem Baptist Association on February 10, 1985. Before accepting the call to pastor Bethesda, Rev. Scott served as Religious Program Director for the Butler Street YMCA, Atlanta, Georgia and Assistant to the Pastor of Zion Grove Baptist Church, Atlanta, GA. where The Reverend H. D. Freeman is Pastor. Pastor Scott is a Gospel preacher, teacher and revivalist, having preached throughout South Carolina. Pastor Scott has also preached in the States of Texas, New Jersey, Kentucky, Tennessee and Georgia. He has also preached on the national level in settings of the National Baptist Convention of America. Pastor Scott has served in positions on both the national and local levels. He previously served as a member of the Publishing Board of the National Baptist Convention of America, Inc. and writer for the Brotherhood Manual and Young Adult/ Sunday School literature. He has served as an Associate Dean for the National Baptist Convention of America, Inc., Congress of Christian Education, Dean of the Georgetown Baptist Educational Union #1 and State Congress Regional Director for the South Carolina Baptist Educational and Missionary Convention. 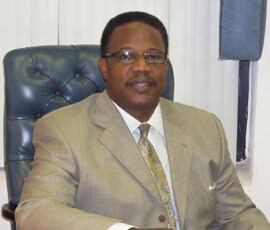 As a member of the Ministerial Alliance, Pastor Scott served as a Volunteer Chaplin at the Georgetown Memorial Hospital. Currently, Pastor Scott serves as Chairman of the Executive Board of the Jerusalem Missionary Baptist and Educational Association and continues to write Sunday School literature. During Pastor Scott's tenure at Bethesda, many programs, projects, and/or activities were implemented including Vision 2001, Annual Church Outing, Youth Bible Study, Early Morning Sunday School, and Family Night. The Church Training Union (CTU) formerly Baptist Training Union (BTU) was reactivated. The roof and dome of the sanctuary were repaired along with refinishing the ceiling. The indebtedness of the church has been liquidated, the pews in the sanctuary have been cushioned, and most recently two ministries added. Pastor Scott humbly accepted his God - given assignment as pastor on May 4, 2000 and strives to move with God as he leads the people to spiritual maturity. He is married to the former Tonya L. Holloman of Atlanta and they are parents of one son, Alani.